. Districts of Edo 江戸の町 .
. Yakimono, pottery and Haiku . The oldest pottery in the world and in the long history of its development there are so many styles and areas involved, it is easy to loose track. 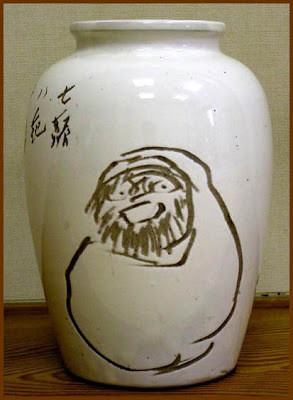 Talking about Japanese Pottery and Daruma san, I make the distinction between Daruma as a decorative figure or statue (okimono 置物), Daruma painted on a piece of pottery for use, for example a teacup, a soy sauce poorer or an oil dish. In this field we find Daruma almost everywhere! I will cover that in the separate stories. And finally pottery items for use in the form of Daruma, for example incense burners, toothpick holders and the like. This also calls for different stories. 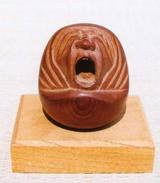 Many pottery centers have some special type of Daruma objects, so I will cover the Pottery of Arita, Bizen, Kutani, Oribe etc. in extra stories. There might be more in time.
. My ALBUM - Pottery .
. My ALBUM - Kutani 九谷焼　Pottery .
. Join the Yakimono Friends on Facebook ! . For more than 30 years, Dr. Anneliese and Dr. Wulf Crueger—guided by Saeko Itô—have devoted themselves to studying, understanding, and collecting Japanese ceramics. Today, they share the rich fruits of their knowledge with this lavishly illustrated volume based on their own collection. The equivalent of Roberts Museum Guide, devotees of beautiful ceramics can pick it up and use it to select and visit potters as they undertake an artistic tour of the country. Organized geographically, it goes from kiln to kiln—which in Japan may refer to a lone site or an entire ceramics region that contains hundreds of workshops. Along the way, they outline the history, development, and unique stylistic characteristics of each area’s work, and the traditions that inspired it. is the Japanese art of fixing broken pottery with lacquer resin dusted or mixed with powdered gold, silver, or platinum a method similar to the maki-e technique. As a philosophy it speaks to breakage and repair becoming part of the history of an object, rather than something to disguise. The pattern is engraved in a kind of scrafitto by etching the image through the slip. This kind of pottery has a history of more than 200 years. Now there are six kilns that produce it. Hirashimizu, to the south of Yamagata city is a renowned pottery producing area. It is said that at its peak there were some 20 producers in the area. This number has now dwindled to six which are enjoying the recent boom in ceramics. The peach Celadon style whereby the iron particles protrude through the celadon glaze giving the pottery a peach-skin effect is particularly well known. 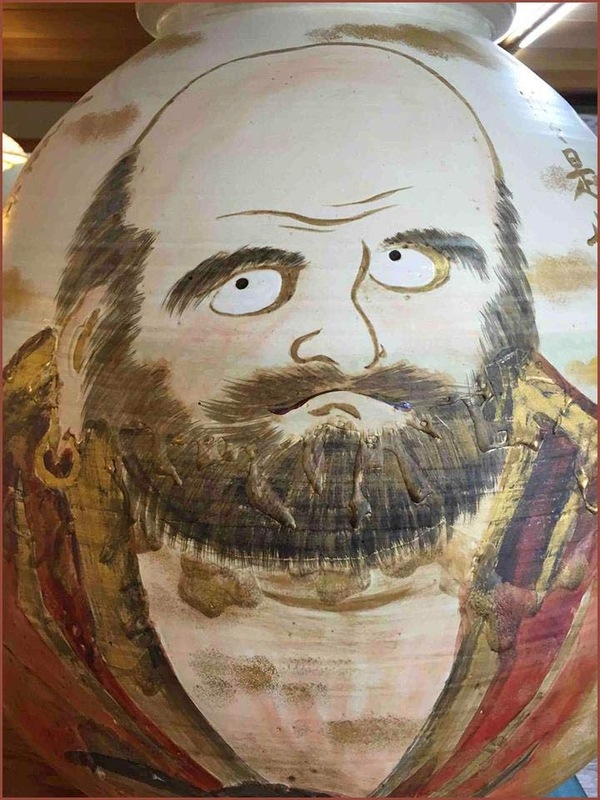 Pottery lessons and tours of the buildings where the potters sit at their wheels can be arranged by the Shichiemon, Bun'emon and Heikichi potters.
. . . CLICK here for Daruma on pottery ... Photos ! All kinds of pottery were called "Setomono" in Edo, but in Western Japan they were called Karatsumono　唐津物　"Things (pottery) from Karatsu". Seto 瀬戸 is a pottery town in Aichi. - - - More about Seto Pottery in the WIKIPEDIA ! 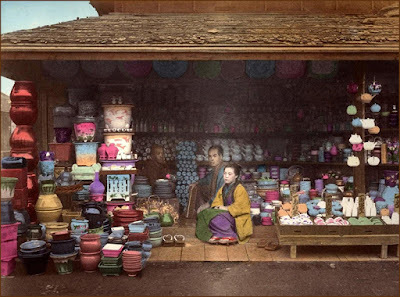 In the Setomono district of Edo were many shops selling pottery and crockery. One of the first to open shop was 水野兵九郎　Mizuno Heikuro. The eastern part of the district bordered to a wide river-canal Nishi-Horidome 西堀留, where ships from Seto could land easily. There were also many wholesalers of Sake, incense sticks (senkoo　線香 and dried food (kanbutsu　乾物) in the district. During the Year-End season, a popular market, (toshi no ichi　年の市) was held in the Western part of the district. 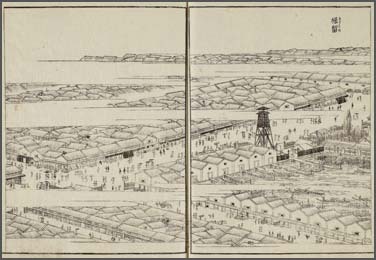 Because of the wide waterway, many wholesalers (tonya　問屋) had their warehouses here, especially rice dealers. 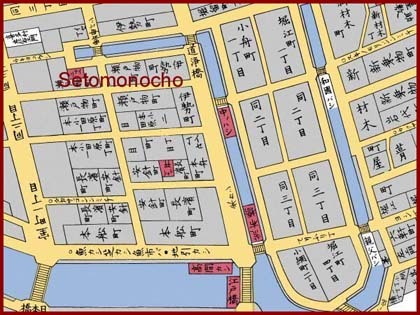 The Horidome district was located in the vicinity of modern Nihonbashi Horidome-chō 1-chōme and 2-chōme; it being positioned along an excavated bund that faced onto and altered the flow of the two Horidome rivers (east and west). Water transportation was used extensively in the area during Edo times, with the town becoming well-known for its rice traders. ... 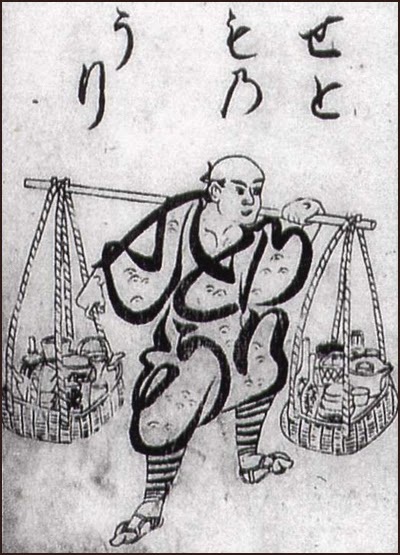 In 1691, he moved to Edo's Kobunacho and became the apprentice of a grain trader named Tarokichi Aburaya. in 1704, he opened a wholesale store in Kobunacho. In the following year, he changed his name to Ihee and the name of his shop to Iseya Ihee 伊勢屋伊兵衛. He then started a retail store in Setomonocho, Nihonbashi (present day Muromachi 2-chome) in 1720, which is now the location of the current Ninben head office. First fish of the season was extremely expensive, and if he bought it, surely heaven himself would be surprized and start a shower.
. daitsuuya juuhachi 大通屋十八 18 big spenders . 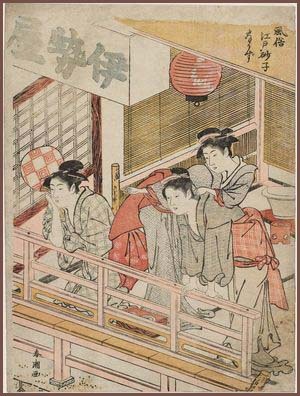 The big 18 were the most famous of this group, most of them were the money-lenders of Kura-Mae 蔵前.
. 小舟町 Kobunacho, Kobuna Cho district EDO .
. ABC List of Edo craftsmen　江戸の職人 . ..... The neighborhood we are entering now is home to a community of potters, and the shops on the main street have row after row of porcelain and pottery lined up on the shelves and tables. Each store offers a range of different types of plates, saucers, mugs, bowls and vases. Pottery is a highly developed craft in Edo, though the best products still come from the far western provinces of Suo, Aki and Nagato. 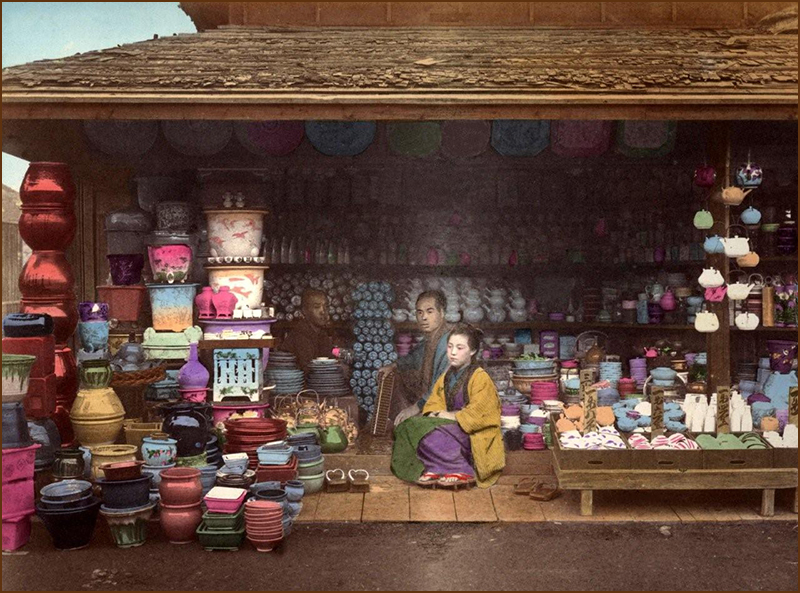 A wide range of different styles of pottery are available, from inexpensive dishes used by average townspeople to the works of master craftsmen, which can fetch extremely high prices from rich daimyo, merchants or members of the Emperor's court. Everyone is intent on what they are doing, and take their work seriously -- even the youngsters and women who prepare the clay for use in making the pottery. 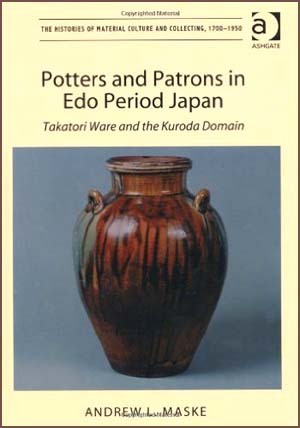 Like many of Edo's crafts, there is a close connection between the business of making pottery and the expression of fine art. Apprentices may produce large amounts of simple pottery for daily use while they are learning their craft, but their goal is always to develop their skill to a fine level and to create true works of art. The center of the potter's district is almost uncomfortably warm. You can feel the heat from the kilns as soon as you enter the square. The huge ovens used to bake the porcelain are set up in the center of the district, and they are tended carefully to ensure that the temperature is kept at just the right level. Around the square, individual craftsmen are shaping clay into different types of products. Every few minutes, someone will carry another large rack of molded pottery over to the kilns to be baked. This neighborhood can be unbearably hot in the summer time, since potters have to work all year round. On the other hand, it isnt such a bad place to visit in the winter. Each of the crafts districts is entirely devoted to producing their specialty products, and each member of the community has a part to play. Most of the people are closely bound together by ties of kinship and community, and all work together to help the entire neighborhood become prosperous.
. Imado yaki 今戸焼　Imado ware . Since his ware can break easily, he does not dare to speed up or hurry during a rainfall. Once a woman could not forgive the sins of her man and committed suicide by drowning in the pond and became a Dragon Deity. If people throw shards of pottery into this pond, she gets angry and brings great rain over the area. If other women commit suicide in the pond, they will be transformed into snakes and serpents 蛇身. Once a man exchanged a cow for a rooster which could lay golden eggs. He wanted to have one more and decided to buy another cow to exchange it. That night Kannon Bosatsu appeared in his dream. She made him realize that this was too much of greed and he needed to change. 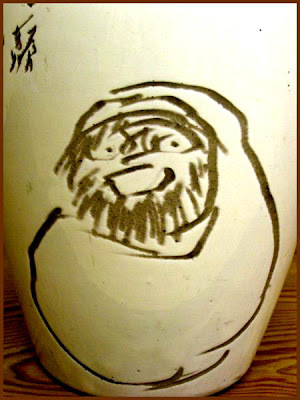 The next morning when he awoke, the golden egg had turned into an egg of pottery. Good Photos and Explanation, Diversity of Japanese Design. This is a Collectors' Help and Info Page for collectors of antique Chinese and Japanese porcelain with several thousand pages of information available without charge. 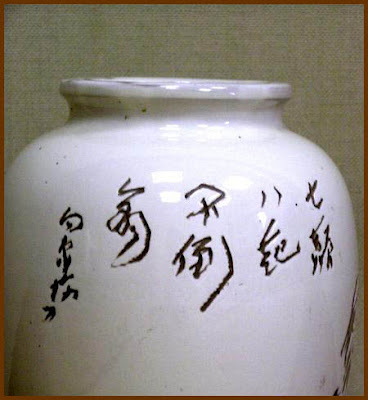 Among them is an extensive archive of translated and dated Japanese and Chinese porcelain marks, a glossary of pottery, porcelain and ceramic art terms, Chinese porcelain history articles and documents, Chinese travelogues, tons of pictures and Question & Answer pages. join in on facebook ! Japan Pottery Net was founded to introduce Japanese ceramics to the entire world, thanks to the partnership of the distinguished ceramic artists whose works are the cultural heritage of Japan. Through the exhibition of art galleries and museums, artistic values of Japanese pottery are appreciated worldwide. Therefore, there are considerable numbers of Japanese ceramic-lovers even outside of Japan. 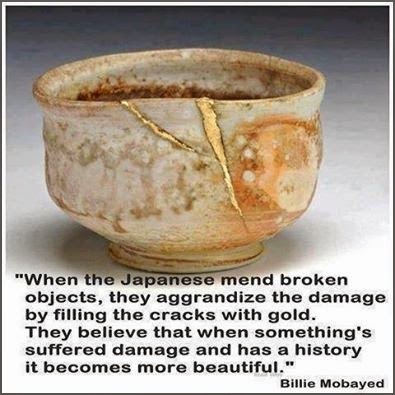 Unfortunately, some have not had a chance to meet with the sense of beauty that Japanese craftsmen have succeeded in creating for hundreds of years. The ceramics of the renowned high-class artists in Japan are hardly distributed outside of Japan. Even in Japan, it is hard to gain access to prestigious Japanese ceramics unless they are displayed in department stores or private exhibitions. 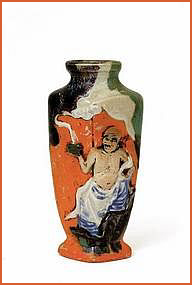 Most of the works are stored in the artists’ private potteries in the countryside, which gives few opportunities for people in the cities or from foreign countries to get to know such treasures. The list of Japanese ceramics sites (日本の陶磁器産地一覧 Nihon no tōjiki sanchi ichiran) consists of historical and existing pottery kilns in Japan and the Japanese pottery and porcelain ware they primarily produced. The list contains kilns of the post-Heian period. 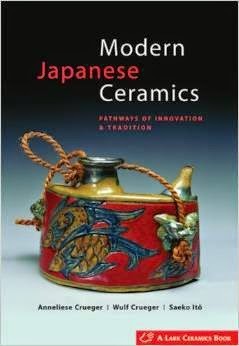 Not listed are ancient earthenware pottery such as Jōmon pottery, Yayoi pottery, Haji pottery, Sue pottery, Kamui ware, etc. which are general topics whose origins and production cannot be linked to just one specific kiln. Shimamono are objects that were imported from southeast Asia, but later produced locally as well. Mishima pottery despite its name is of Korean origin.